Today's post is a tutorial to show you how to recreate this makeup look. I tried to keep the colours quite light and bright, so it's perfect for spring. For the skin, I didn't mattify too much and I used blusher to give me a rosy glow. To find out how I did this, keep reading! 1. Prime your skin with The Body Shop's 'Matte It' primer. This will keep your makeup in place and help it go on smoothly. 2. With a Real Techniques makeup sponge, blend some concealer under your eyes. At this stage you can add foundation if you'd prefer, but I personally wanted to keep my makeup very light coverage. 3. Set the concealer in place with a touch of powder. 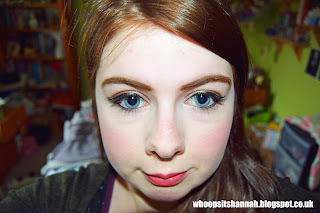 I used the Rimmel 'Stay Matte' in 'Transparent'. Try not to use too much - we're only trying to set the concealer, not keep the face matte. Of course, if you prefer a dewy look, skip this step entirely. 4. Take a bit of blusher over the apples of the cheeks. Mine is from The Body Shop, and it's in the shade '02 Coral'. 5. Use some shimmer highlight to add glow, which I think is perfect for spring. I use the palest 'Shimmer Pearls' from The Body Shop. 6. Fill in your brows with the Freedom 'Brow Powder Duo' on an angled brush. Mine is in the shade 'Dark Brown'. 1. 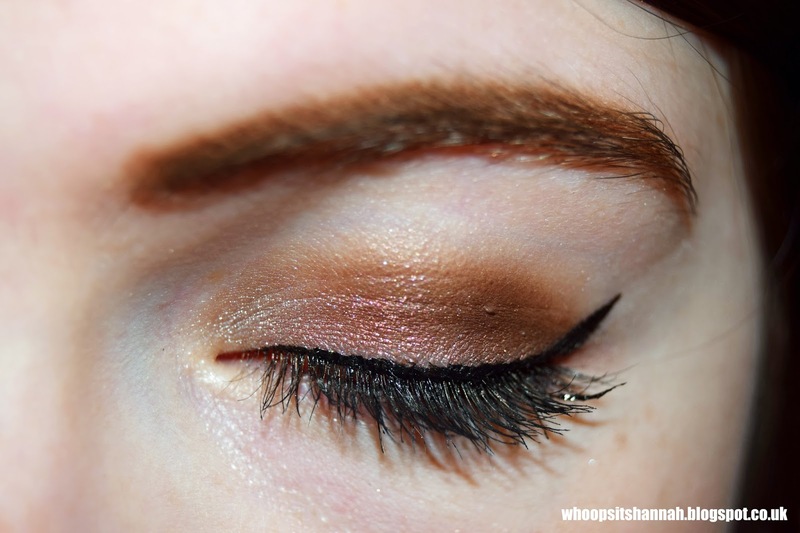 Take a light brown shade into your crease. 2. 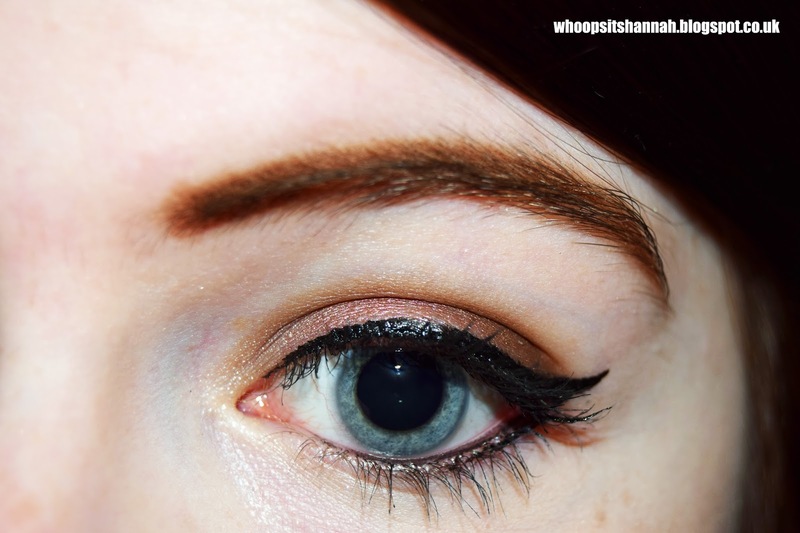 In the outer corner, add a darker brown shade, taking this halfway along the crease. Blend the two shades together with a fluffy brush. 3. Pack a shimmery pink shade over the lid, taking care not to cover the work you just did in the crease. 4. Do winged liner in whatever style you normally would. I used the Barry M 'Eye Define' waterproof liner in 'Super Gloss Black'. Take a little bit of the eyeliner under the eye, just to the centre of the lashline. 5. Use a black kohl pencil in the waterline for added definition. Mine was from Barry M.
6. Finally, add a coat Maybelline's 'The Colossal Go Extreme' mascara in 'Very Black' to lengthen the lashes. Finish the look with a quick swipe of Clinique Chubby Stick in the shade 'Chunky Cherry' over your lips. This gives a sheer coverage that's perfect for spring, while adding a pretty pink colour to your lips. Let me know what you thought of this look in the comments! Thank you very much! <3 I actually do wear contacts as I am RIDICULOUSLY short sighted haha :P thank you for reading! Also forgot to say but I really like the font you use in your header photos - so pretty!